Hotpoint AC were a little down on numbers for their Sunday fixture on the Beastie Lake, but fishery owner Diane Band very generously let the club have the majority of pegs on the lake so anglers were given plenty of room. And how grateful they were too as it turned out to be a really productive match. Matchwinner Kevin Schneider completely dominated with a fine catch of 137lb 10oz - most taken close in on cat meat. 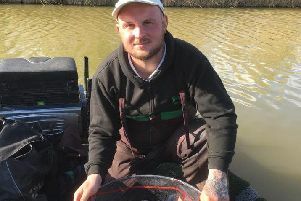 Vincent Stapleton feeder fished his way to the runner-up spot with 95lb 13oz, then came Peter Telszewski with 86lb 6oz. Fenland Rods had a cracking result from the Beastie Lake on Saturday. The father and son combination of Dave Garner and son Neil stole the show with two fine nets of carp taken close in on cat meat. Dave took the honours with an impressive 225lb 4oz net on peg 30 with Neil putting 185lb 12oz to the scales. Third place went to Mac Campbell on 117lb 13oz, followed by Bill Foster with 100lb.